A 90-year-old male tripped in his house, fell against a wall, dragging his ear along the wall. He was not on anticoagulation and the injury occurred 12 hours prior to arrival. Auricular hematomas can occur when shearing forces are applied to the auricle. This occurs traditionally in wrestlers. These shearing forces separate the perichondrium from the cartilage allowing for hematoma to develop within the space. If the hematoma is not evacuated, cauliflower ear can develop. Additionally there was some concern that the hematoma was so tense, that there may be developing areas of necrosis due to impedance of blood supply. Treatments of auricular hematomas include simple aspiration of the hematoma or incision and drainage. A Cochrane Review in 2004 found no trials to demonstrate superiority in technique to remove the hematoma for the best cosmetic outcome. Given the size of the hematoma, we elected to perform an incision and drainage rather than a simple needle aspiration. With the patient’s consent, I documented the procedure for the purposes of giving a step by step guide to draining auricular hematomas. There are two ways to achieve an auricular field block. An auricular ring block in which the needle is guided in a ring formation around the auricle from two insertion sites, made superiorly and inferiorly. The other approach, pictured here, is to inject just anterior to the tragus, to anesthetize the auricular temporal nerve and inject along the posterior sulcus to anesthetize branches of the greater and lesser auricular nerve. Anesthetic preparations with epinephrine should be avoided for local infiltration, as there is a theoretical risk of tissue necrosis. After prepping the area with chlorhexadine or betadine, incise through the skin overlying the hematoma down to the cartilage. For optimal aesthetic outcomes it is best to try to follow the curvature of the pinna. Express the hematoma through the incision. Irrigate the pocket with normal saline to express the small areas of hematoma that remain. Finally, apply some antibiotic ointment to the incision. This is perhaps the most critical step of the process as the compression dressing keeps the perichondrium firmly apposed to the cartilage and prevents hematoma from redeveloping within the space. There are two options for compressive dressings, surgical or non-invasive. A surgical dressing involves suturing through the thickness of the ear to fix dental rolls both anteriorly and posteriorly to the ear. The second option is noninvasive and requires packing the ear and firmly applying a Kerlix wrap, and is shown below. First we packed the entrance of the external auditory canalwith a cotton ball. Then we packed the ear with saline soaked gauze. We padded the ear posteriorly with multiple folded 4 x 4 inch gauze sheets. Finally Kerlix was firmly wrapped around the patient’s head, compressing the ear between the saline soaked gauze and the dry gauze padding posteriorly. Although there is limited data on antibiotic use in auricular hematomas, it is generally recommended to empirically treat with systemic anti-staphylococcal antibiotics for 7-10 days. Consider adding pseudomonal coverage in your immunocompromised patients. When Should Your Patient Follow Up? Recommend your patient to follow up in 24-48 hours to evaluate for hematoma reaccumulation. Typically the compression dressing must stay until ear is fully healed, which can be anywhere from 7-10 days or more. ENT or plastics follow up is recommended because the risk of poor cosmetic outcomes can result despite proper evacuation of the hematoma. The term “cauliflower ear” is based on the fact that the pressure, scarring and neocartilage formation at the site of the clot creates a deformity similar to the appearance of a cauliflower. It is imperative to recognize an auricular hematoma! Early treatment of this condition will prevent permanent disfigurement and improve cosmetic outcomes. Necrosis begins within 24 hours. Advise your patient to avoid contact sports until the ear has healed completely as the hematoma can reaccumulate if reinjured. Remember to place dressing both posterior and anterior to the ear to maintain pressure to prevent re-accumulation. If the injury occurred greater than 7 days after the trauma, refer your patient to an ENT for repair as the patient’s ear may require debridement. Instruct your patient to inspect the wound frequently to return for signs of vascular compromise or infection. Wonderful descriptive and pictorial views for a challenging traumatic process. 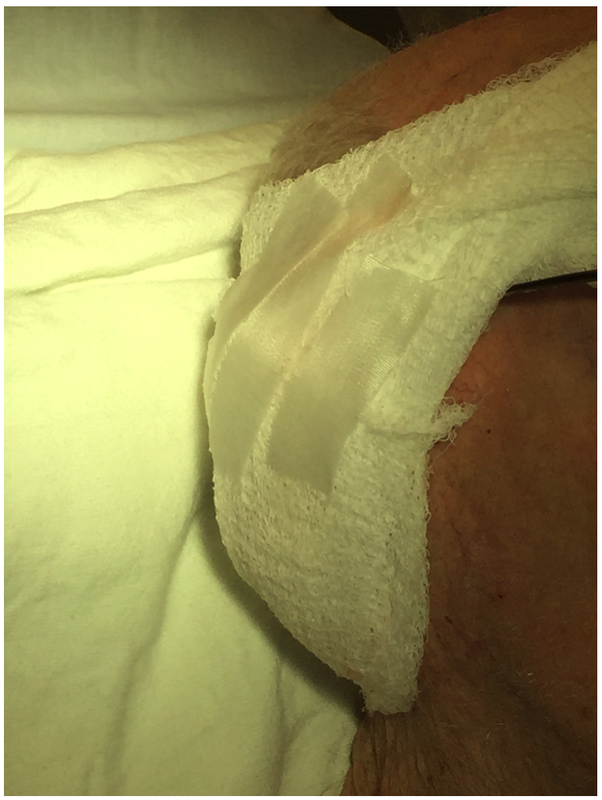 Your management was thoughtful and expert – to the extent we can use the term expert when no optimal strategy has been defined for management of auricular hematomas. Auricular hematomas have been recognized in paintings and sculptures all the way back to Greek and Roman times (next time you are in Athens or Rome check out some of the sculptures, many have cauliflower ears, specifically Apollonius) . Boxers, wrestlers, rugby players and pankratiasts were common victims to this malady. You ask what a pankratiast is? Pankration is a combination of boxing and wrestling, or the equivalent of current day mixed martial arts (MMA). It was only in the 1970’s when the pathophysiology which results in cauliflower ear was recognized as an accumulation of blood in the subperichondrial space of the pinna. This mechanical barrier between cartilage and blood supply results in necrosis, fibrosis and deformity if not treated expeditiously. Many forms of treatment have been studied including needle aspiration, ultraviolet rays, continuous portable vacuum, fibrin glue application and incision and drainage. Suffice it to say that management is a challenge and a thoughtful approach to each patient’s unique circumstances is important. A study in 2013 in wrestlers using an 18G angiocath drainage technique had 90% of athletes back to sports in 1 week . The catheter was left in for continuous drainage and the dressing was checked in 3 days. In 2014, using an incision and drainage technique, fibrin glue was placed into the wound to improve hemostasis and promote adhesion . Dental rolls were sutured around the wound with good results. Needless to say there are many ways to “skin the cat” but not one optimal strategy. Antibiotics are still recommended but with no good literature to support their use. What we do know is that early treatment is important, frequent monitoring (even daily rechecks to assure no re-accumulation) and compression dressings (not too tight but tight enough to avoid fluid build-up) are keys to good outcomes. Jones, S.E.M., Mahendran, S. Interventions for acute auricular haematoma. Cochrane Database Syst Rev. 2004; (CD004166). Mudry A and Pirsig W. Auricular Hematoma and the Cauliflower Deformity of the Ear: From Art to Medicine. Otol Neurotol 30:116-120, 2009. Brickman K, Adams DZ, Akpunonu P, et al. Acute Management of Auricular Hematoma: A Novel Approach and Retrospective Review. Clin J Sport Med 2014;23:321-323. Mohamad SH, Barnes M, Jones S, et al. 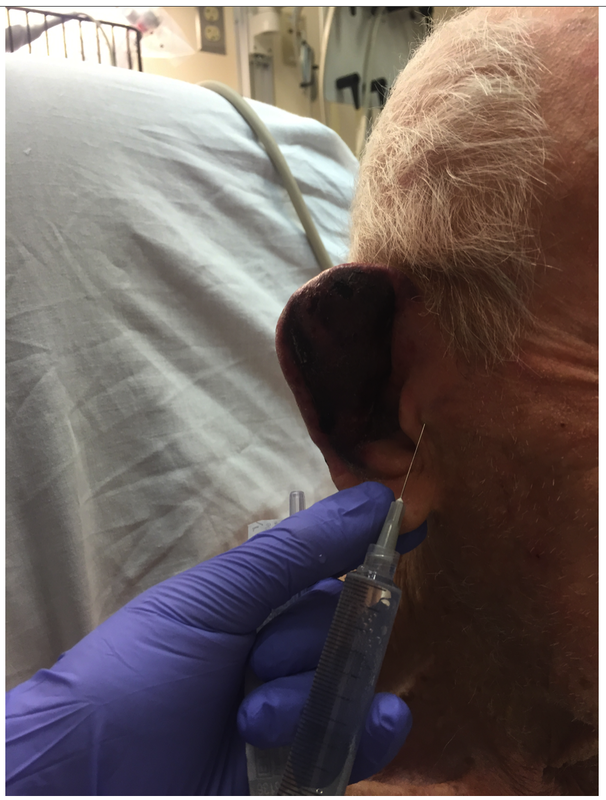 A New Technique Using Fibrin Glue in the Management of Auricular Hematoma. Clin J Sport Med 2014;24:e65-e67.